In experiments in rats and human cells, Johns Hopkins Medicine researchers say they have added to evidence that a cellular protein signal that drives both bone and fat formation in selected stem cells can be manipulated to favor bone building. If harnessed in humans, they say, the protein -- known as WISP-1 -- could help fractures heal faster, speed surgical recovery and possibly prevent bone loss due to aging, injury and disorders. Our bones have a limited pool of stem cells to draw from to create new bone. If we could coax these cells toward a bone cell fate and away from fat, it would be a great advancement in our ability to promote bone health and healing." Previous studies by others, James points out, showed that a particular type of stem cell -- perivascular stem cells -- had the ability to become either bone or fat and numerous studies since then have focused on advancing the understanding of what signaling proteins drive this developmental change. 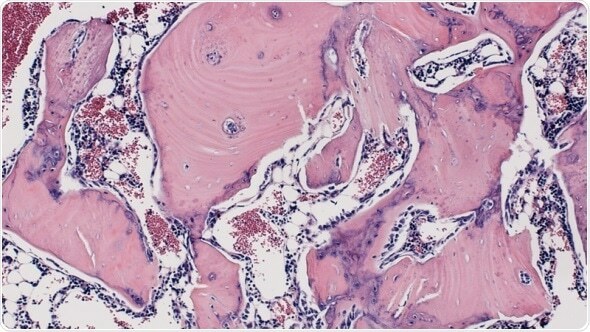 The team then engineered human fat tissue stem cells to make more WISP-1 protein than normal, and found that three genes controlling bone formation became twice as active as in the control cells, and fat driving genes such as peroxisome proliferator-activated receptor gamma (PPARγ) decreased in activity in favor of "bone genes" by 42 percent. With this information in hand, the researchers next designed an experiment to test whether the WISP-1 protein could be used to improve bone healing in rats that underwent a type of spinal fusion -- an operation frequently performed on people to alleviate pain or restore stability by connecting two of the vertebrae with a metal rod so that they grow into a single bone. An estimated 391,000 spinal fusions are performed in the U.S. each year, according to the U.S. Agency for Healthcare Research and Quality. Such a procedure requires a massive amount of new bone cells. If we could direct bone cell creation at the site of the fusion, we could help patients recover more quickly and reduce the risk of complications." In their experiments, the researchers mimicked the human surgical procedure in rats, but in addition, they injected -- between the fused spinal bones -- human stem cells with WISP-1 turned on. After four weeks, the researchers studied the rats' spinal tissue and observed continued high levels of the WISP-1 protein. They also observed new bone forming, successfully fusing the vertebrae together, whereas the rats not treated with stem cells making WISP-1 did not show any successful bone fusion during the time the researchers were observing. We hope our findings will advance the development of cellular therapies to promote bone formation after surgeries like this one and for other skeletal injuries and diseases, such as broken bones and osteoporosis."